A Traveler Abroad – Where Am I? Set in a private nature reserve spread over 1,000 acres of Central America’s last remaining lowland tropical rainforest, Lapa Rios Ecolodge overlooks the point where the Golfo Dulce meets the wild Pacific Ocean. Designed in harmony with the surrounding forest and beach, the main lodge and 16 bungalows, sparsely lined along three ridges 350 feet above the sea and connected by paths, were built with local materials, including fallen trees, and have intricately woven palm thatched roofs. 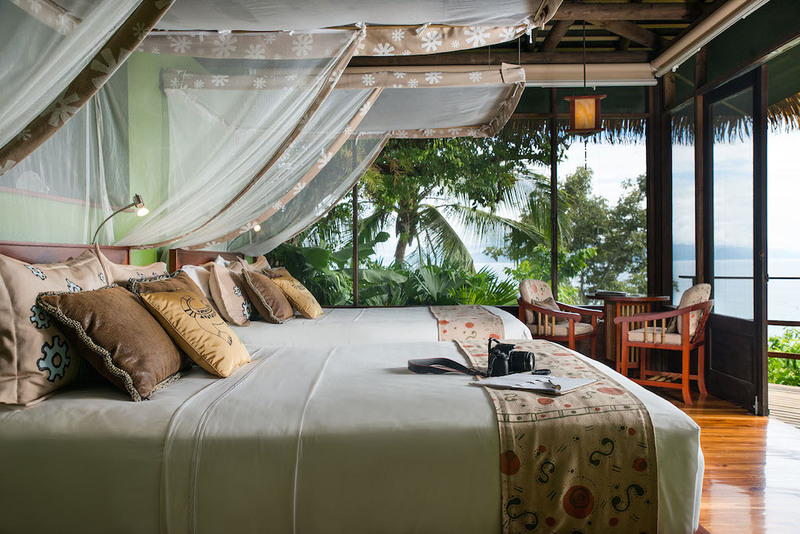 From the lodge’s three-story circular stairway one can get breathtaking views of the forest canopy and the ocean. There are huge private decks, and the comfortable bamboo furniture is locally made. Minnesota couple John and Karen Lews first envisioned Lapa Rios as a private nature reserve. Theu used all their assets to purchase a large tract of rainforest and to build a small ecotourism project. Thanks to help from The Nature Conservancy and CEDARENA, this primary forest will be preserved in perpetuity and the land never developed. 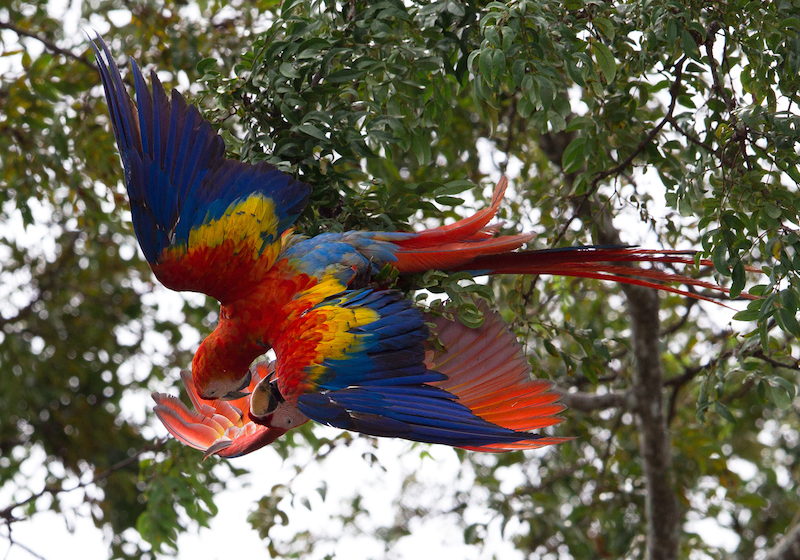 The Lapa Rios Reserve helps buffer the Osa Peninsula’s Corcovado National Park and serves as a wildlife corridor. Lapa Rios believes in the power of education, so in January 1991 it brought together a group of neighbors to discuss the idea of opening a school. At the time, most neighbors had never met each other nor had they known that they shared a common ideal: education. Most families were illiterate and were unaccustomed to the idea of their children attending school. Out of this meeting came the Carbonera School, and today some kids walk an hour through the forest to attend class, where they receive both formal and environmental lessons. The lodge employs only local community members, guaranteeing income to more than 45 families. Members of the community, often from the local elementary and high schools, come to the hotel weekly dressed in folkloric outfits and present the typical dances of Costa Rica to the guests. Lapa Rios supports their efforts by sponsoring their dance teacher, giving them the outfits, and organizing their transfers. Tips left by guests go to the dancers. Regularly, Lapa Rios invites local artists to sell their crafts on the premises, and in many cases the artists meet guests and give them the opportunity to work with them on making something. Since 2006 Lapa Rios has supported a scholarship program for the students of its employees. 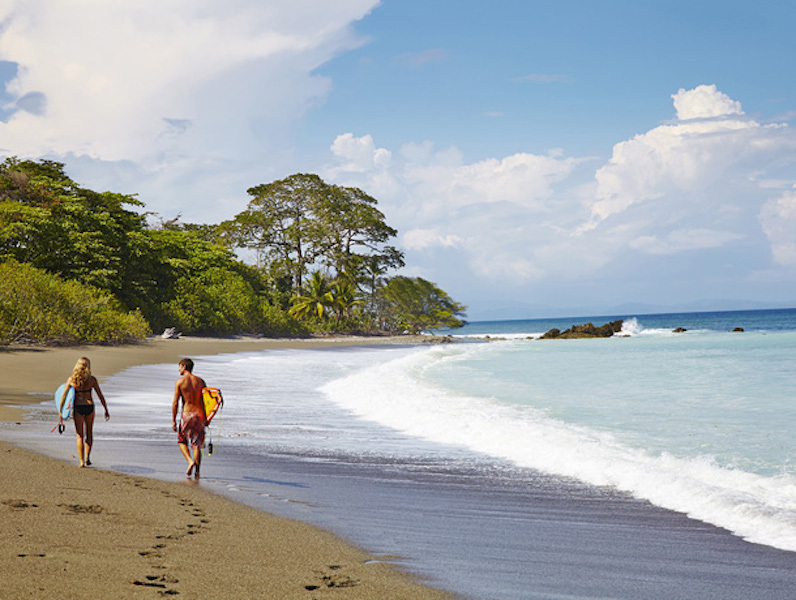 Using a competitive application and selection process, the hotel selects two children and pays for their tuition at the private, bilingual school in Puerto Jimenez. Lapa Rios has innovative energy-saving practices, including feeding non-compostable organic garbage to pigs to produce methane gas from their waste and then capture that gas for cooking in the employee kitchens. Even though the property has its own springs, water use is carefully monitored. The property gardens consist of local plants, and only organic fertilizers and natural non-toxic pesticides are used. This helps with water conservation since they require less water during the dry months, and they also restore habitat and attract birds, insects, reptiles, and mammal species. 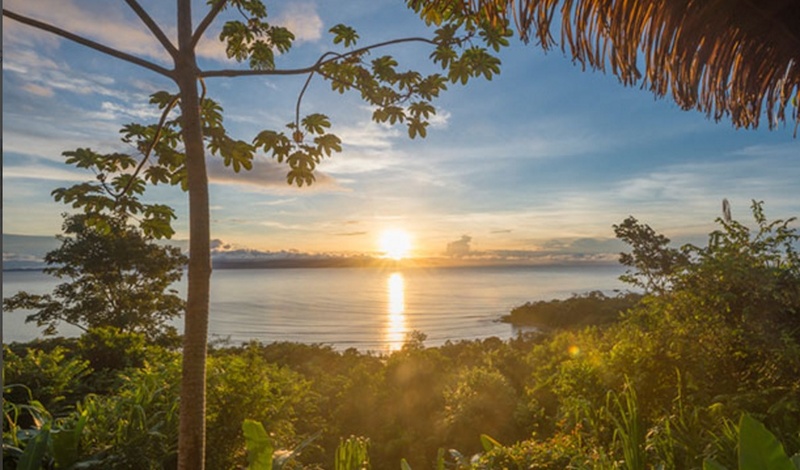 As a neighbor to Corcovado National Park, Lapa Rios supports park rangers by donating equipment, such as boots, walkie-talkies, and sleeping bags. It has paid the salary of one ranger for over six years. The lodge also supports The Wildcat Conservation Program that works to determine the status of feline populations and their prey on the Osa Peninsula. The project uses cameras and video equipment to watch wild cats in action and study their behavior and population densities in order to better protect and save these highly endangered species. Lapa Rios donates money to purchase the cameras and video equipment and has supported the participation of the researchers in key academic conferences. Guests are encouraged to donate to the project and take a tour with the researchers to help them place cameras in the forest. Previous articleThink SA Luxury Train Fares Are Exorbitant? Think Again. If you would like to contribute an article (or photos) to SAPeople.com - please write to admin@sapeople.com. Thank you!